Best Carry On luggage is arguably the most essential travel item aside from your passport. Travel has become so very accessible and more and more of us are jetting off for long weekends away and mini breaks. These short haul trips don’t require a great deal of luggage but equally, we need to pack light and pack savvy. We have researched and reviewed the best carry on luggage on the market in 2017 for you, here are our top picks. What are the Benefits of the Best Carry On Bag? What to Look for in Carry On Luggage? What is the Best Way to Use Carry On Luggage? Choosing your carry on luggage is easy really. The first step in the process is to set yourself a budget. Luxury carry on bags can cost you upwards of $1000 if you chose a well respected designer brand. Not many of us have that cash to splurge, and let’s face it, we’d rather spent it on flight tickets! You can purchase a suitable carry on bag for as little as $20! After you have set yourself a budget the next things to think about are style and size. If you really want to travel light then you could opt for a small 15l backpack, similar to that you used to use at school. If you are only going away for one or two nights then all you need is your wash bag, phone charger and one change of clothes. Many of us like to pack a little more into our bags. A 30L bag is the most common choice for travellers and will fit the airline’s baggage requirements. There are countless benefits of a carry on bag but let us address the primary ones first! As we mentioned earlier, many of us are now hopping around the continent of a weekend using budget airlines to get us from A to B. These budget airlines are sneaky when it comes to baggage allowances. In order to keep fare costs down they do not include hold luggage in the price. As such, you have to pay extra for checking in a big bag. As a compensation, they allow you to carry one piece of carry on luggage into the hold with you. This must be less than 7kg in weight and fit their stipulated dimensions. This is free. By choosing your carry on luggage wisely you can maximise the amount you carry with you in the cabin and eliminate the need to spend extra money on checking in a big back. There are a few things to look for when you are buying yourself a new carry on luggage set. Always check the dimensions of the bag. Most airlines adhere to the same dimensions of 22 cm x 35 cm x 56 cm. Some bags will be advertised as carry on approved but may in fact be bigger than these dimensions. Durability is another factor to consider. Your new carry on luggage is an investment that you will want to stand the test of time. Be sure to check the zippers and straps. If the bag has wheels check that they won’t sieze up or become unaligned over time. Carry on luggage is designed for short haul trips or ultra light packing long haul travellers who want the challenge of literally taking only what they can carry. 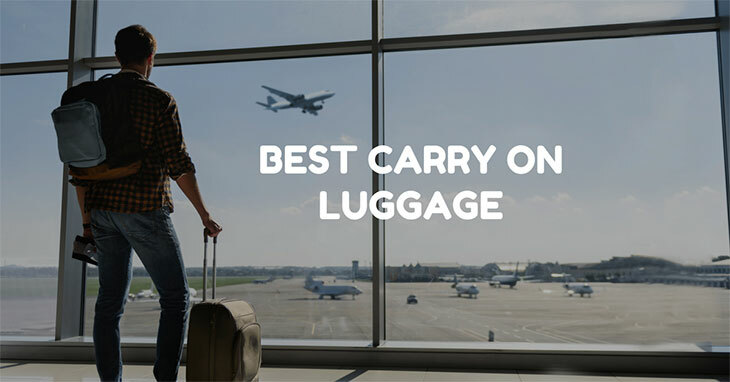 Carry on luggage is great if you are going on a business trip in your own country; we have spoken about the benefits of this kind of luggage for air travel but it also has its merits if you are travelling by train or by car. Trains only stop for a two or three minutes maximum so getting on and off the platform needs to be a streamlined manoeuvre, carry on luggage is small enough that you can zip around as quickly as possible. The negatives about carry on luggage is pure and simply the lack of space. If you need to carry a lot with you then carry on luggage is not a good option. That said, if you do need to carry a bigger bag when flying long haul then a carry on bag is a good idea as you can keep all the essential items and things you need to access quickly in here and leave the other items in your big checked in bag. The only real prerequisite of using carry on luggage is that you are travelling. The main concept of these kinds of bags is that you are travelling by air. These styles of bags are specifically designed to fit in the cabin of aircraft and be easy to carry on and off the plane. The eBags TLS Mother Lode Mini 21" Wheeled Duffel is a great mid-range carry on luggage bag. This bag has a retractable handle to make transportation of the bag much easier, match this will a pair of smooth rolling wheels and they make the perfect pairing. The eBags TLS Mother Lode Mini 21" Wheeled Duffel comes in a variety of colours including blue, green and red to suit your tastes. Further desirable features of eBag’s most popular wheeled duffel is that it comes with a lifetime warranty meaning that any issues you have with the bag will be sorted free of charge by eBags. An added bonus of the this carry on bag is that it absolutely complies with airline regulations for carry on baggage size requirements. Additionally the zippers feature photo-reflective cords which help keep you safe and illuminated, especially when travelling at night. The main compartment of this carry on luggage can be unzipped to expand giving you extra space, perfect for packing in those souvenirs from your trip! The expansion offers you an extra 33% space. The Briggs & Riley Baseline Domestic Carry-On Expandable Upright is the most luxurious bag featuring in our 2017 top picks. Briggs and Riley focus on producing top range travel bags and luggage. This does mean that it is more expensive than most other bags of this style on the market. This luxurious travel bag is black in colour and sleek and chic in design. For a timeless look from your carry on luggage this bag is the choice for you. Made from 100% nylon the bag is durable and easy to clean too. Thanks to the high quality instilled by Briggs & Riley their popular carry on bag has very good zippers which add to the security of the bag. A major bonus of the this upright travel bag is that it comes with a lifetime warranty. This lifetime warranty covers so much more than the standard warranty offered by many other brands and manufacturers, this warranty from Briggs and Riley covers damage caused by your airline. So, rest assured that whatever trouble may come your luggage’s way you bag and your belongings will be protected. The Delsey Quilted Rolling UnderSeat Tote is our most alternative carry on bag in our list of 2017 top picks. This bag is marketed toward women first and foremost but in all honesty the black material that the bag is made from and the overall design means that it is fairly unisex. One great feature of this under seat stow away bag is its small size. It is a sturdy and durable style tote bag. As a result the bag is designed to fit comfortably underneath your airplane seat. This is a really savvy, almost cheeky, way to max out on your cabin luggage allowance. You will be able to put your bigger carry on bag up, overhead in the locker bin and keep this bag beneath your seat throughout the journey. Surprisingly for a tote bag this piece of luggage also has speedy wheels for easy of movement as well as a retractable pull along handle too. There are multiple pockets in this bag, designed by Desley, to keep all your belongings neat, tidy and organised throughout your trip. To suit your personal preference the Delsey Quilted Rolling UnderSeat Tote is available in three fashionable colours; jet black, vibrant navy and subtle teal. As far as sturdy, durable and multifunctional bags go the Eagle Creek Tarmac 22 Inch Carry-On Luggage bag is the outright winner for our 2017 top picks. The perfect travel bag features Bi-Tech Armour that keeps all your belongings super save while you travel. The industrial design of this carry on bag is highly desirable and there are multiple straps and hooks for you to attach you extra items like hiking boots or a yoga mat to the outside of the bag. For those traveling further afield or for longer periods of time this style of bag is a very good choice. Receiving consistently high praising reviews from travel industry and travellers themselves the Eagle Creek Tarmac 22 Inch Carry-On Luggage is a great investment piece. The bag has lockable stash pockets, custom designed by Eagle to keep all your high value items like laptop, tablet, phones and other tech safe and secure. One additional feature of the Eagle Creek Tarmac 22 Inch Carry-On Luggage is the Coat Keeper hook that allows you to store ironed or freshly dry cleaned suits to the outside of the bag. The Samsonite Wheeled Backpack is the ultimate form of carry on luggage featuring wheels, retractable pull along handle and backpack straps too. The backpack straps of this Samsonite bag are a unique feature for carry on luggage and places this high on our list of top picks for 2017. This carry on backpack is made from rip-stop nylon which is sturdy and reliable, this kind of fabric seldom breaks, tears or becomes worn. The sleek black design of the Samsonite Wheeled Backpack makes it unisex and versatile. Although made of nylon this carry on bag must be washed by hand. That said it is very easy to clean with warm soapy water and a sponge. Fast to dry too. The bag cannot be washed in a washing machine due to the metal parts of the retractable handle. These are sturdy but not built to withstand the trauma of a pounding from a washing machine! Featuring inline wheels, this carry on bag by Samsonite slides across the floor with ease. For those occasions that the ground is uneven or bumpy simply retract the handle back into the bag and open up the straps. Adjust the straps to suit your stature and walk on! It really is that simple and the Samsonite Wheeled Backpack is truly versatile. This bag easily fits the carry on baggage allowance of all major and budget airlines which is a massive bonus. Light enough to haul up on to the security check desk the bag is perfect for all occasions. Retractable handle needs careful use. It is a tough call between the Eagle Creek Tarmac 22 Inch Carry-On Luggage and the Briggs & Riley Baseline Domestic Carry-On Expandable Upright. Our winner is the Eagle Creek Tarmac 22 Inch Carry-On Luggage with Briggs & Riley coming in a close second. In terms of good value for money, durability and versatility the Eagle Creek Tarmac 22 Inch Carry-On Luggage comes up trumps. Perfect for travel by air on business or leisure this bag by Eagle Creek provides you ample space for packing and abundant security features too. We particularly like all the options given by the Eagle Creek Tarmac 22 Inch Carry-On Luggage for attaching additional items like hiking boots or yoga mats to the bag on the outside if they do not fit inside. 2017 has provided some tough competition for carry on luggage bags but we think that our top picks are the best carry on luggage option available on the market right now! I'm Linda Smith. I'm passionate about traveling and I'm here to share with you all my travel experiences and tips. I hope all these things will make your travel easier.